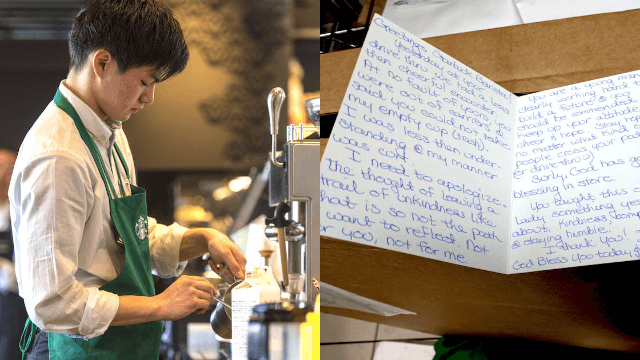 Customer who was rude to a Starbucks barista redeems herself in viral letter. As a former barista, I know dealing with rude customers is part of the job. So when a customer was rude to this Starbucks barista, he probably forgot about it quickly and moved on to the next thing. Such is the service life. "A woman came through the drive through yesterday and got a little irritated with me because we didn't have drink carriers," he wrote. "Today, she came back and handed me this." Greetings Starbucks Barista! Yesterday at your drive thru we had a less than cheerful encounter. At no fault of yours, you were out of carriers and said you could not take my empty cup (trash). I was less than understanding and my manner was curt. I need to apologize. The thought of leaving a trail of unkindness like that is not the path I want to reflect. Not for you, not for me. You are a young man, clearly working hard to build a fortune and you should be commended. Keep your attitude of cheer & hope. Stay hopeful no matter what kind of people cross your path (or drive thru). Surely, God has good blessing in store. You taught this ole lady something yesterday about kindness, compassion & staying humble. I thank you! God bless you today and all your todays. Debbie. This is refreshing. Apologies in general are so rare—but especially from rude customers, who have the luxury of never returning to the scene of their rude crime. But this one came back, owned her behavior, and even brought cash. Overall, a solid apology. The letter has gone viral, and hopefully has inspired other formerly rude customers to do the same, or at least be nicer in the future. Besides, being rude to anyone who is about to hand you a beverage is just straight up dumb. Be better, people. Or you could be sipping on someone else's saliva.